Batman v Superman: Dawn of Justice, the epic blockbuster by DC Comics and Warner Brothers, will hit theaters around the world in March 2016! 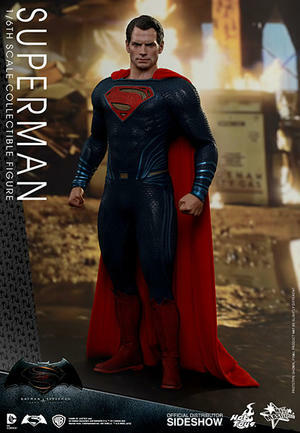 In this exciting film, fearing the actions of the god-like Superman left unchecked, Gotham City's own formidable and forceful vigilante Batman will take on Metropolis' most revered, modern-day savior. 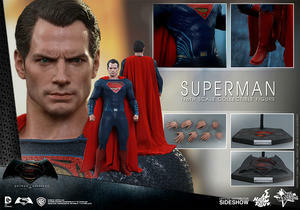 To get fans ready for this installment of the DC Extended Universe, Sideshow Collectibles, and Hot Toys are very excited to officially present the sixth scale collectible figure of Superman from Batman v Superman: Dawn of Justice! 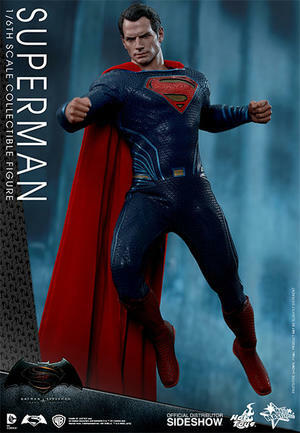 The movie-accurate collectible is specially crafted based on the image of Henry Cavill as Superman in the movie and features a newly developed head sculpt, movie-accurate body proportion, newly tailored Superman costume with embossed pattern, the iconic red cape made with new material, and a specially designed Batman v Superman: Dawn of Justice themed figure stand.